This album consists of a selection of some of the most beautiful works of the romantic 19th and early 20th century repertory. The brilliant Piano Concerto by Edvard Grieg, played by Wang Haii Jie, one of China's New Generation of great piano talents. »From Holberg's Time«, the delightful suite for string orchestra, Puccini's beautiful »I Crisantemi«and Prokofjevs seldomly played, but most interesting »Overture on Hebrew Themes« for clarinet, piano and strings. 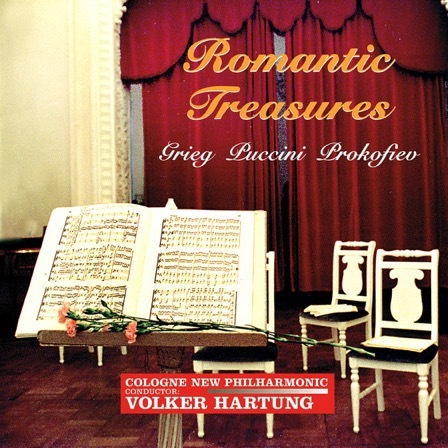 Volker Hartung and the Cologne New Philharmonic Orchestra can be heard in some of their most vivid performances in the wonderful acoustics in Hamburg's and St.Petersburg's Concert Halls and recorded in brilliant 20bit/48 kHz high-end sound. This album is a festival for your ears! There were certainly no more interesting, more individual and more courageous conductors in these first two decades in the cultural life of Berlin, as Oskar Fried. His program selections were consistently daring and highly modern for the time. He conducted world premieres of new works by Busoni and Pfitzner and the Viennese School, Schonberg, Berg, Webern. He also had the luck to be contemporary of the greatest musicians of the 20th century, and took advantage of the opportunities to learn from them. He was acquainted with Hans Pfitzner, Arnold Schonberg, Feruccio Busoni, Igor Stravinsky, Alexander Scriabin, Richard Strauss and many others and conducted their works, often as their first interpreter. His special love was the work of Gustav Mahler (the manuscript of the Adagio from his 10th Symphony is seen on the cover of this album). He had the incredible opportunity, to study all his symphonies together with the composer himself who in turn offered to him the Berlin premiere of his sixth and eighth symphonies. What experience! Which conductor can claim today, to have studied so close to the original source! This unique historical advantage make up the unique value of his performances besides his amazing sensitivity and his strikingly hypnotic talent to lead his Orchestras, which is fortunately preserved on a number of early acoustic and then electric records. His performance practices were highly remarkable. 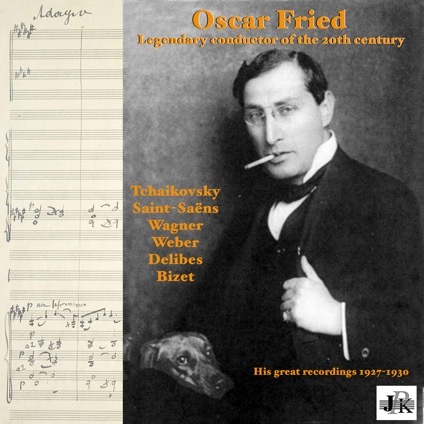 I have made the effort, therefore, to restore the 78-rpm shellac recordings by Oskar Fried from my collection and publish them for you, dear listener, in the best possible sound and give you the opportunity to listen back to an era when Symphonic recordings were still an adventure, a sensation of the moment, for which an orchestra gave everything, to look back a time when conductors lived who managed to draw secrets from scores of romantic symphonic music, which they new from composers who shared the same epoch.